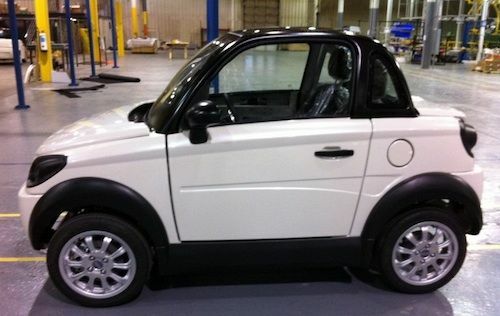 Last summer, GreenTech Automotive launched manufacturing of a small two-seater neighborhood electric vehicle in Tunica, Mississippi, an event that would barely have deserved notice if it weren't for the caliber of the politicians who were at the launch event. The company chairman, Terry McAuliffe was formerly Chair of the Democratic National Committee and an aide in the Clinton Administration, on-hand was former President Bill Clinton as well as former Mississippi Gov. Haley Barbour who is also former Chair of the Republican National Committee. Now, as McAuliffe has launched a new bid to become Governor of Virginia, GreenTech Automotive is being reexamined and recent news reports found that the state of Virginia thought GTA did not have a viable business plan. See GreenTech Automotive launches tiny electric car with help of Bill Clinton and Haley Barbour for our previous coverage. The company is promising a line of electric cars starting with the MyCar, a neighborhood electric vehicle with a 115 mile driving range, at 25 miles/hr (it's an NEV). Cars they expect to build later include a hybrid electric sports car, however it is the MyCar which seems to be the best developed. The MyCar's design dates back over 10 years to a joint collaboration between the Design School of the Hong Kong Polytechnic University and the School of Design in Milan. Hong Kong Polytechnic University took the design, and formed a company to develop it further eventually launching sales and production in Hong Kong in 2009. Following his previous (failed) attempt to be elected Governor of Virgina, McAuliffe and GTA bought EuAuto, the company behind the MyCar, in May 2010 and almost immediately GTA was presented at a Clinton Global Initiative fundraiser event. By July 2012 the company's political connections, through McAuliffe, had paid off with a package of incentives arranged by Haley Barbour allowing the company to begin building a factory in Tunica, an area better known for the 7 casino's in the county that's located just south of Memphis. The recent news reports have focused on GTA's attempt to get help from the Virginia Economic Development Partnership (VEDP), to obtain economic development incentives allowing GTA to locate its factory somewhere in Virginia. Between 2009 and 2012, GTA was shopping around the country for "depressed localities" in which to set up a factory. In addition part of the funding plan for GreenTech Automotive is the EB-5 Visa program which allows foreign investors to potentially win U.S. Citizenship by participating in stimulating the U.S. economy through job creation and capital investment in American businesses. The program was created by Congress in 1990 and has been renewed ever since. According to reports by the Associated Press and the Franklin Center for Government & Public Integrity (watchdog.org), the VEDP didn't bid on GTA's proposal. According to the AP, Virginia officials were dubious of the project from the beginning, they did not see how GTA would reach forecasted sales (100,000 MyCar's), that GTA lacked brand recognition, had not demonstrated anything about the vehicle, did not have emissions approval from the EPA, had no distribution network, and had nobody in executive management with experience in automobile manufacturing. This is a big promise that sounds exciting until you think it through, and see that sales of neither NEV's or electric cars even approach the 100,000 vehicle figure McAuliffe tossed out. Over priced golf carts do not have a good sales history in this country. I think VA made the right choice.